Gerbera daisies, flowering perennials native to South America, thrive in USDA hardiness zones 9 through 11 in the United States. One of the most popular flowers for arrangements and bouquets, gerbera daisies bloom during late spring and early summer. The plants produce large, colorful blossoms up to 4 inches in diameter. The flowers, available in both single and double forms, appear in shades of white, red, pink and violet. The plant tolerates only light frost and often performs as an annual in zones 8 and above. 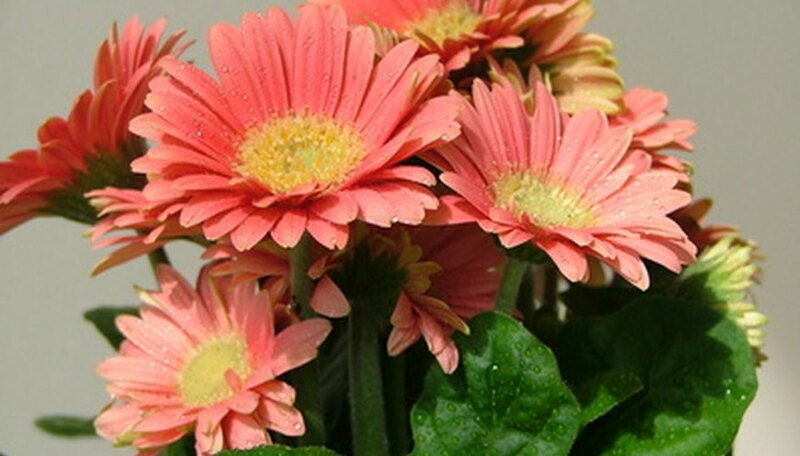 Gerbera daisies can survive until the next season in cooler areas, however, with proper winter care. Plant gerbera daisies outdoors during early spring in a location that receives full sunlight and consists of moist, rich, well-drained soil. Spread a 1-inch layer of compost over the ground and use a tiller to cultivate the site, incorporating the compost into the soil to a depth of at least 6 inches. Space gerbera daisies 12 to 15 inches apart. Water the plant once every five to seven days during spring, summer and fall to keep the soil slightly moist at all times. Reduce the frequency of watering to once every 10 days during winter. Soak the soil to a depth of 4 to 5 inches at each application. Feed gerbera daisy once every month during spring and summer to provide plenty of nutrition for foliage and flower production. Use a balanced 10-10-10 NPK fertilizer at the rate recommended by the manufacturer. Water the site lightly before feeding to prepare the soil for the fertilizer. Remove all damaged, faded and dead flowers whenever possible throughout the growing season. This process, known as deadheading, helps the plant conserve nutrients and deters the risk of fungal infections. Take cuttings from the plant anytime during the blooming season, and new blossoms will replace the old shortly after. Dig up gerbera daisy or allow it to die back completely in zones 8 and above, as the plant cannot survive the winter outdoors. If you wish to keep the plant for the following season, repot the lifted bulb in a container filled with potting soil and store indoors during the winter. Transplant to its original location outdoors the following spring. Leave gerbera daisies planted outdoors year round in USDA hardiness zones 9 through 11. If left in the garden through winter in zones 8 and above, the plant will die completely and you'll have to start over with new bulbs or plants the following year. Propagate by collecting and planting seeds from spent flowers.